What lies ahead in 2013 for UTC Compiegne? President Professor Alain STORCK gives his answers. When Prof. Alain STORCK was confirmed as President of UTC in 2012, he introduced a tremendous, novel idea, to set up a local eco-system for innovation and creativity. It will become reality at the end of 2013 and Alain STORCK comments “In order to make UTC Compiegne a European-scale university institution, building on opportunities to innovate and create, we had to establish such an eco-system in our Region of Picardie. Inasmuch as the ecosystem is rooted in the regional context, it accompanies the international thrust of UTC, thanks to partnerships signed between the University, the Regional Authorities and industrial entrepreneurial partners”, stresses Prof. STORCK. The key feature, the UTV Innovation Centre will be delivered and commissioned end-2013; its purpose is to optimise the main links between the system’s actors, and to promote and enhance innovation wherever possible: with technological upgrades, in marketing protocols and practice, in organisation and management and in pedagogy, etc. This local eco-system will also be placed under shared governance, UTC and the Picardie Region, the city of Compiegne and its suburbs and local enterprises. 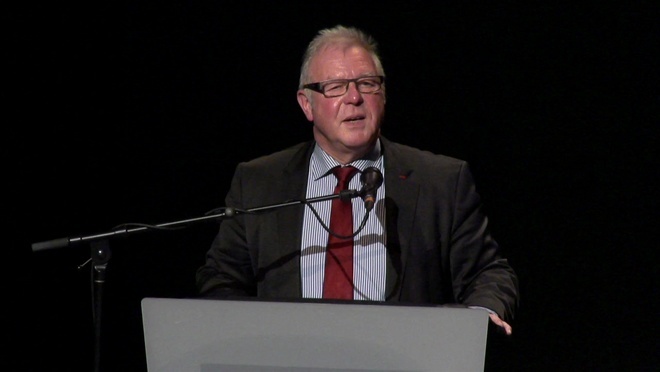 “I did not want UTC Compiegne to be the only driving force of this local network, which improves the attractiveness of the area to favour the installation of new research h centres, branches for foreign universities, foreign companies and leading proponents of our specialities”, adds the President of UTC Compiegne. Does this herald in a new vision for UTC’s training cursus? “Well, without going as far breaking with tradition and the initial ambition to see engineers and engineering at the heart of innovation processes, we see the new local ecosystem and the new cursus Humanities and Technology, not forgetting our joint teaching venture with China, UTSeuS, as an answer via an evolution in our pedagogy and courses to better meet the demands of a changing world”, explains Alain STORCK. UTSeuS which is a training and research branch of UTC within the University of Shanghai will soon be followed by a second similar unit in Chile, located in the French Lycée at Viňa del Mar. There is an overarching vision for these ongoing developments: to ‘build a worldwide University of technology” based on complementary branch nodes all digitally inter-connected. “The point is that new ICT communication technologies are integral components of the new vision, but the contact teacher-student will not disappear” adds Prof. STORCK. The new UTC Humanities and Technology course is a real challenge, consisting of matriculating student from the L (literary) and ES (economics) baccalaureate streams. Its inception corresponds to a wish expressed both by the students and by enterprise at large; the aim is to enable recruitment of engineers who will gain from both the technical and the general culture training modules. “The ambition of UTC Compiegne is to reconcile science, technologies, humanities and social sciences, and thereby produce graduate engineers capable of thinking in technical terms and also on the social and environmental consequences of the technologies implemented. For example, notions such as “the zero and infinity” are taught from various angles: mathematics, philosophy and technologies,” details Alain STORCK. These ongoing changes correspond to a new kind of engineer, who will be faced with the societal expectations arising through economic, social and environmental crises. “Engineers for the 21st century must be more humanist, more creative, more innovative and more open to the world around them” feels Alain STORCK, who also is a believer in mixed formats, such as “engineer-doctor” with the visible development of “e-medicine”. Thanks to its Department of Bio-Engineering, UTC will be in a position to answer this need. “It is also within the remit of UTC, besides producing new knowledge and know-how, transmitting them and transforming them into innovative products, processes … to train entrepreneurs. UTC graduates, we can note, have set up some 110 new companies over the past 10 years. To go beyond this level, we now have planned for what we call an ‘entrepreneurship pole’, based in our Innovation Centre”, he recalls. The fear that Prof. STORCK entertains is that the French State may not be in a position to honour its commitments, financially speaking, to support the ambitious development project at UTC Compiegne and to allow the “future infrastructure schemes” to become reality. ”First and foremost among my concerns at the moment is how to increase and diversify UTC’s funding. There are several ways to achieve this : firstly, through development of the UTC Foundation, where the next funding raising campaign aims at securing 10 Meuros over 5 years; the second is to reinforce links with the economic/industrial tissue in terms of partnership research agreements and the “apprenticeship” tax, viz., on local professional activities that accrues to teaching establishments in France; thirdly, to proceed with a possible rise in student matriculation fees for non-French nationals in our student population and at the same time setting up a grant system, etc., for those in need”, adds prof STORCK. Moreover, the various alliances signed by UTC Compiegne are gaining in impetus: the network of French universities of Technology (UTC,UTMB and UTT) to produce an enhanced level of attractiveness; our alliance with the University Jules Verne – Picardie which is compliant with territorial logic, embodied in a Regional conference of higher education a research establishments and our complementary choice of thematics in the framework of the PRES Sorbonne (Government supported Pole for research and higher education). 2013 indeed holds some highly promising prospects!